On-chip system that detects signals at sub-terahertz (radiation) wavelengths could help steer driverless cars through fog and dust. Autonomous vehicles relying on light based image sensors often struggle to see through blinding conditions, such as fog. But MIT researchers have developed a sub-terahertz-radiation receiving system that could help steer driverless cars when traditional methods fail. Sub-terahertz wavelengths, which are between microwave and infrared radiation on the electromagnetic spectrum, can be detected through fog and dust clouds with ease, whereas the infrared based LiDAR imaging systems used in autonomous vehicles struggle. To detect objects, a sub-terahertz imaging system sends an initial signal through a transmitter; a receiver then measures the absorption and reflection of the rebounding sub-terahertz wavelengths. That sends a signal to a processor that recreates an image of the object. But implementing sub-terahertz sensors into driverless cars is challenging. Sensitive, accurate object recognition requires a strong output baseband signal from receiver to processor. Traditional systems, made of discrete components that produce such signals, are large and expensive. Smaller, on-chip sensor arrays exist, but they produce weak signals. In a paper published online on Feb. 8 by the IEEE Journal of Solid State Circuits, the researchers describe a two dimensional, sub-terahertz receiving array on a chip that’s more sensitive, meaning it can better capture and interpret sub-terahertz wavelengths in the presence of a lot of signal noise. To achieve this, they implemented a scheme of independent signal mixing pixels called “heterodyne detectors” that are usually very difficult to densely integrate into chips. The researchers drastically shrank the size of the heterodyne detectors so that many of them can fit into a chip. The trick was to create a compact, multipurpose component that can simultaneously down mix input signals, synchronize the pixel array, and produce strong output baseband signals. 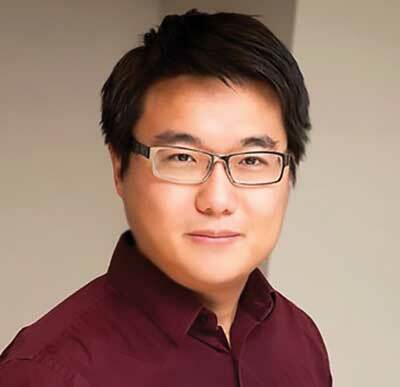 “A big motivation for this work is having better ‘electric eyes’ for autonomous vehicles and drones,” says co-author Ruonan Han (right), an associate professor of electrical engineering and computer science, and director of the Terahertz Integrated Electronics Group in the MIT Microsystems Technology Laboratories (MTL). The key to the design is what the researchers call “decentralization.” In this design, a single pixel called a “heterodyne” pixel generates the frequency beat (the frequency difference between two incoming sub-terahertz signals) and the “local oscillation,” an electrical signal that changes the frequency of an input frequency. This “down mixing” process produces a signal in the megahertz range that can be easily interpreted by a baseband processor. The output signal can be used to calculate the distance of objects, similar to how LiDAR calculates the time it takes a laser to hit an object and rebound. In addition, combining the output signals of an array of pixels, and steering the pixels in a certain direction, can enable high resolution images of a scene. This allows for not only the detection but also the recognition of objects which is critical in autonomous vehicles and robots. Heterodyne pixel arrays work only when the local oscillation signals from all pixels are synchronized, meaning that a signal synchronizing technique is needed. Centralized designs include a single hub that shares local oscillation signals to all pixels. These designs are usually used by receivers of lower frequencies, and can cause issues at sub-terahertz frequency bands where generating a high power signal from a single hub is notoriously difficult. As the array scales up, the power shared by each pixel decreases, reducing the output baseband signal strength which is highly dependent on the power of local oscillation signal. As a result, a signal generated by each pixel can be very weak, leading to low sensitivity. 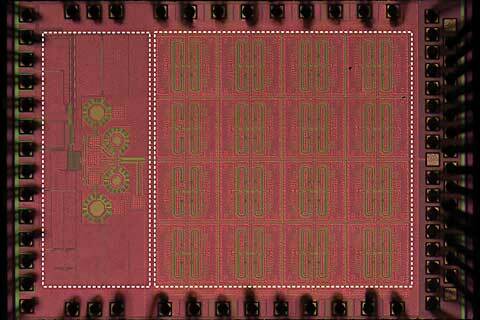 Some on-chip sensors have started using this design, but are limited to eight pixels. The researchers’ decentralized design tackles this scale sensitivity trade off. Each pixel generates its own local oscillation signal used for receiving and down mixing the incoming signal. In addition, an integrated coupler synchronizes its local oscillation signal with that of its neighbor. This gives each pixel more output power, since the local oscillation signal does not flow from a global hub. The researchers’ design, on the other hand, gives each site its own water pump, eliminating the need for connecting pipelines, and gives each sprinkler its own powerful water output. Each sprinkler also communicates with its neighbor to synchronize their pulse rates. The new architecture, however, potentially makes the footprint of each pixel much larger which poses a great challenge to the large scale, high density integration in an array fashion. In their design, the researchers combined various functions of four traditionally separate components — antenna, downmixer, oscillator, and coupler — into a single “multitasking” component given to each pixel. This allows for a decentralized design of 32 pixels. To that end, the researchers incorporated into their chip a component called a phase locked loop, that locks the sub-terahertz frequency of all 32 local oscillation signals to a stable, low frequency reference. Because the pixels are coupled, their local oscillation signals all share identical, high stability phase and frequency. This ensures that meaningful information can be extracted from the output baseband signals. This entire architecture minimizes signal loss and maximizes control.